As I mentioned in a previous post, Dan and I spent this Valentine’s Day at home, away from the overbearing decorations and crowds. But, since we’re romantics at heart, we couldn’t do away with all celebration, so we made a nice dinner and popped a bottle of champagne. We even held off on the next episode of Battlestar Galactica and ate dinner at the table. Which was a big commitment because the last episode was a cliff hanger (thank the gods for Netflix). This recipe is a time honored favorite in the Rosemond-Hoerr household. 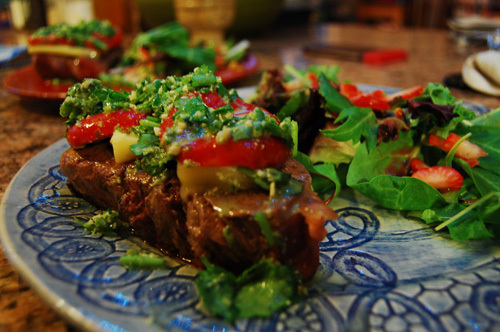 It is also a great dish for a romantic holiday like Valentine’s Day. It’s rich enough that your portion can be small, which is important because this is not the kind of occasion where you want to be stuffed after dinner. The flavors in the salsa are unique yet very complimentary. The sweetness of the honey and the bell pepper compliment the garlic and the poblano pepper, giving you a range of flavors. We paired it with a simple salad and champagne, and followed it with chocolate dipped strawberries, another holiday favorite. The only tricky thing about this recipe is actually getting the poblano to stay submerged. The first step includes soaking the pepper in hot water for an hour. Unfortunately, the pepper is naturally pretty buoyant, so my solution is (as you can see in the photo) to weigh it down with another pot/bowl. It works like a charm and there’s a very satisfying gurgling noise as the pepper fills with water. Boil two cups of water. Pour over your poblano pepper, and let soak for at least one hour. If you need help keeping it submerged, place another bowl/pot on top of it. Slice and core your bell pepper. Drizzle with oil and roast at 400* for twenty minutes. 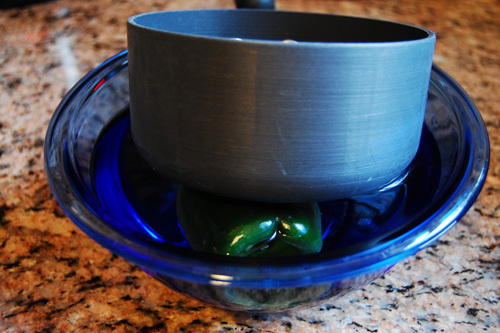 Coarsely chop your poblano and place it in the food mixer, along with 1/4 cup of the water it was soaked in. 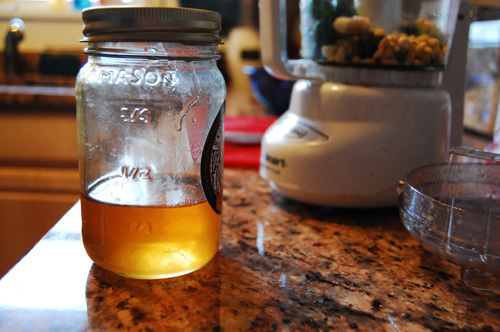 Add honey, garlic, and pine nuts. Blend until smooth. 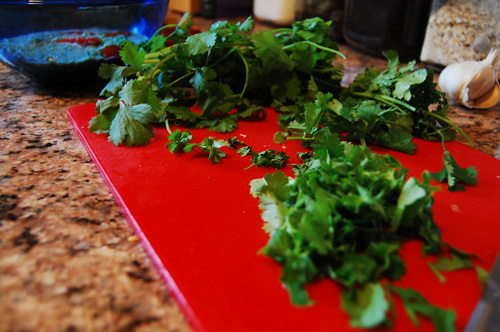 Place salsa in a mixing bowl and stir in vinegar, red bell peppers, and cilantro. Cover and let sit at least thirty minutes. Pat your meat down with a paper towel. Sprinkle salt on one side. 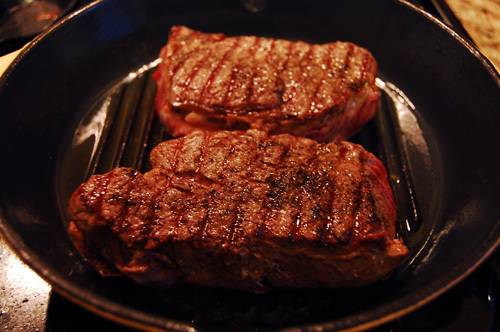 Turn the steaks over and sprinkle salt and pepper on. Grill, pepper side down, for five minutes. Turn and grill an additional five minutes. Flip one last time and place cheese on top of the steaks so that it can melt. Cook for an additional five minutes and then plate. Top with red peppers and salsa, and serve.